Using BFR bands is a perfect way to build big forearms. Occlusion Training with BFR bands will not only give you phenomenal results but will also provide you with mind-blowing pumps! The kind of pumps that make you cry with pain on the outside, yet make you smile on the inside. Definitely one of the best forearm builders for mass techniques without having to use heavy weights. What are BFR Bands and How do they Work? After all, isn’t that what makes those endorphins kick in, and keeps us coming back for more? Getting that pump is the ultimate high. It not only makes us feel awesome and look great but is responsible for building more muscles. And that is what bodybuilding is all about! If you have never used BFR bands in your training routines, you are missing out. It is never too late, and never a better time than now to put these bands into action. BFR bands can be an excellent addition to your current workout routine to build massive forearms in very little time. If you are not familiar with using BFR bands for occlusion training, let me give you a quick rundown before we continue with our bigger forearms training. BFR bands are made from a strong elastic material much like a knee or wrist wrap. These wraps come in different sizes, usually between 1 and 2 inches in width and different lengths for both arm and leg workouts. You can adjust the tightness and lock the band in place with either velcro or a cam buckle mechanism. These bands are placed and tightened at the highest part of your arms or legs. Or in our case just above the forearms. You then tighten these BFR bands to about a 50 to 70% tightness level. Where 100% would be complete blood restriction to the muscle or limb. The whole concept behind the BFR training, also known as occlusion training, is to promote muscle growth by using lighter weights rather than heavy weights. Basically, BFR bands when used correctly are designed to slow down the blood flow leaving the muscle or limb. But at the same time not restricting the amount of blood entering the limb or muscle. 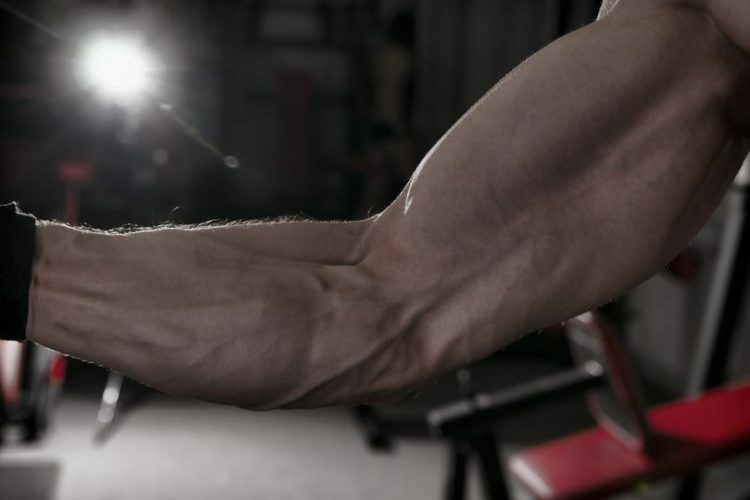 This, in turn, creates a blood pooling effect which will be responsible for creating those mind-blowing pumps you will experience in your training routines to build big forearms. Using BFR bands is by far the best forearm builder for mass without having to use heavy weights. As we mentioned earlier, occlusion training involves using light weights, but also incorporates performing sets at a much higher rep rate and shorter rest period. Don’t be fooled! Only because the weights are lighter does not mean the workout will be easier. The workouts will be tough, and they will be painful. But that’s how we like it! Am I right? Otherwise, what’s the point? Once you start feeling the tremendous pump and see how your forearms are getting bigger and harder, you won’t want to stop anyhow. So all you will need for the following workout routine are a pair of BFR bands and some motivation. Jail House Strong has an excellent video “Forearms First – Building Lumberjack Forearms” where he demonstrates a grueling forearms workout routine using BFR bands to build big forearms. If you are interested in the occlusion bands used in this video, they are the Sling Shot Gangsta Wraps. He starts his forearm routine with 25 reps of reverse curls with 20 to 30% of your 1 rep max. Then he follows that with 25 reps of behind the back wrist curls. These are performed back-to-back with only a 20-second break between exercise sets, alternating back and forth for about 4 total minutes. Your goal is to add 30 seconds each week to this workout until you eventually reach 6 full minutes. He recommends performing this workout 1-2 times per week to get really big forearms. No doubt, a great forearm workout to add to your existing routine. Give it a spin! New Forearm Builder for Mass Workout Technique! If you’re looking for a good pair of occlusion bands to workout your forearms or any other part of your arms, check out our Occlusion Bands Review where we list some of our top BFR Bands. Or check out the Sling Shot Gangsta Wraps shown in the video. Make sure if you do order these wraps, to order the 36-inch and not the 20-inch wraps. The ’20s are great for using as wrist supports, but not enough wrap to work with when trying to wrap around the top of your forearm. I learned the hard way but had no problem returning them for a replacement. If you want to build big forearms, the BFR bands and occlusion training is the way to go. Many of us forget to add forearms to our workout routines. Take a quick look around the gym. How many people do you see engaged in working out their forearms? Not many. If you’re guilty of neglecting your forearms or just want to add some growth quickly and in a fun way, then using BFR bands will get you there. Big forearms are just around the corner. So let’s get busy! P.S And make sure to eat your spinach! You may also be interested in reading a more in-depth definition of Occlusion Training here.